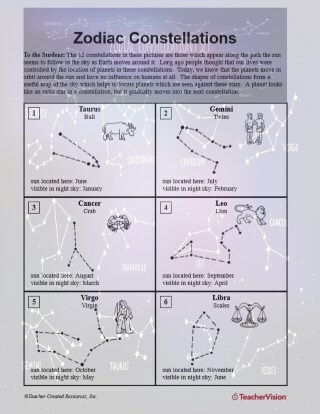 This printable includes pictures and visual representations of the zodiac constellations, which will help students learn more about space and astronomy. After learning about the constellations, they can use this guide to view them in the night sky on their own. This activity is a good supplement for a lesson or unit on space and astronomy, the solar system, or space exploration. Browse a multi-page, printable resource of ready-to-use lessons and cross-curricular activities about space.